Twice a year, every year, we at GrantStation survey individuals associated with grant seeking in nonprofit organizations, educational institutions, government entities, and independent grant-writing shops, to quantify early trends in the world of funding. The most recent data reflects activity from July to December 2014, and the resulting reports, and the benchmarks contained within, can assist you as you navigate the increasingly bumpy waters of grant seeking. Thanks to the input of over 1,800 individuals, the free State of Grant seeking Reports provide guidance on reasonable, real-world levels of organizational funding, based on median awards by organizational budget, location, and mission. In addition, these reports can assist you in your strategic planning and budget process through an awareness of trends months, or even years, before other reports reflect the data. You can make your voice heard by participating today. The data can also help you to manage the expectations of your board and your donors – for example, most organizations do not receive “big money” funding. According to our respondents, “big money” awards of $500,000 and more are reality for less than 20% of organizations. In fact, 58% of respondents received under $100,000 in grant awards in the last six months of 2014. The source and size of an organization’s median largest award is often indicative of the overall grant seeking experience, and we have been tracking this data for years. We also know that an organization’s mission focus has a major effect on funding. You can see evidence of the “mission focus effect” in the chart below, which shows which missions report government funding, and which report funding from sources of smaller awards. For example, the Federal government - the funder with the largest median award size - is the source of the largest median award for no Animal-Related organizations, but they fund 18% of Human Services organizations, and 34% of Educational Institutions. The “mission focus effect” continues with the median largest award size; the variation in the size of the median largest award by mission focus is most dramatic. 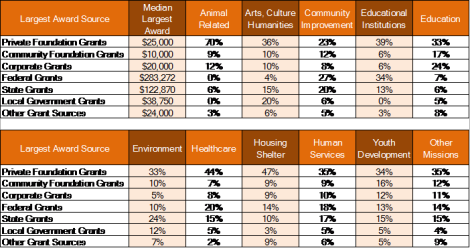 Here we see the median largest award size ranging from $7,500 for organizations with an Animal-Related mission focus, to $52,000 for Human Services organizations, to over $233,000 for Educational Institutions. This type of very specific funding data can assist you in managing real-world expectations of your stakeholders - board members, management, other funders, donors, etc., and assist you in organizational planning, development, and budgeting. I encourage you to download the free State of Grant seeking Report and the individual reports by Mission Focus, and use this information to guide your organization’s grant seeking. It is your commitment, and that of people like you, that make this valuable and trending information possible. Please take part in the Fall 2015 State of Grant seeking Survey - your opinion really does matter. The preceding is a guest post by Ellen Mowrer. Ellen is Director of Business Analysis for GrantStation, a premiere online fundraising resource that provides information on more than 6,500 United States funders and nearly 4,000 Canadian and International funders accepting inquiries.